One of the challenges we constantly deal with as higher ed social media managers is how diverse our audience is. Prospective students want and need much different things than older alumni. My Spidey Sense tells me that Facebook is most effective for connecting with alumni and parents, Instagram is best for current and prospective students, and Twitter is somewhere in between. I finally got around to launching an Instagram page for UP in November 2012, and I have been blown away at how great it has been - I absolutely feel like I have engaged way more with current and prospective students these past few months than I ever did prior to having Instagram. If you're not on there, I would strongly recommend it, even if you're a terrible photographer like me. If you're not sure where to start, very soon I'll be posting an article about my experiences launching a successful Instagram account. Dibs on "Groovin' on the Grounds!" This is great for a few reasons. First, monthly photo challenges are common and native to the Instagram culture, so it's piggy-backing on something Instagram users are already very familiar with. Second, it's a great way to harness and highlight user-generated content, which is one of the best ways to foster engagement with your SM communities. Third, it provides a perfect opportunity to promote your Instagram page across all of your platforms, since a major challenge (so far, anyway... this will likely be changing very soon) is that you can't advertise within Instagram that you have an active presence there. What am I listening to? Prince, like usual. 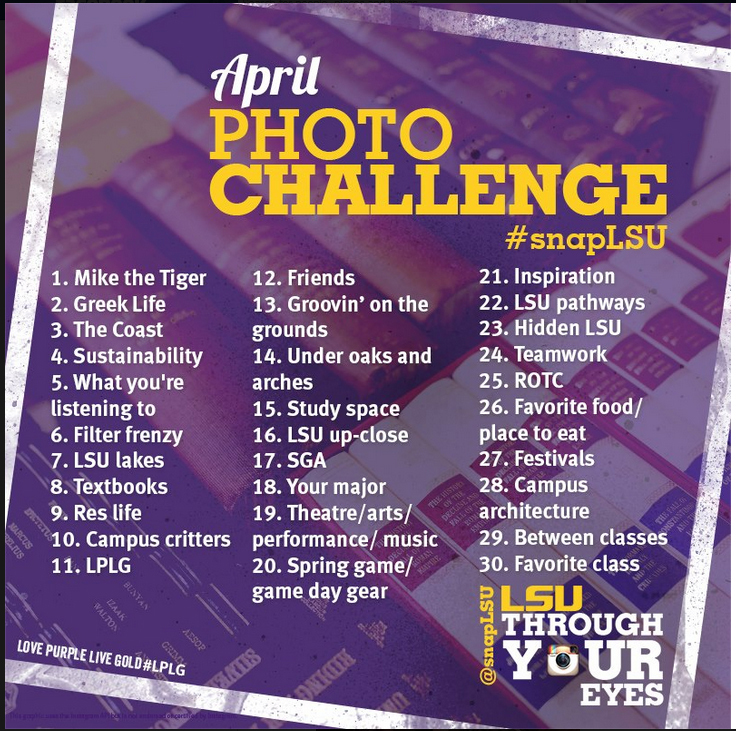 Just searching on the #snapLSU hashtag on Instagram, it's clear this has already become popular with their community and more than 600 photos have been tagged in 10 days. Obviously, it's easier to do something like this at a big school, but I'm confident something similar could work at a smaller school with thoughtful marketing. LSU isn't doing this as far as I can tell [EDIT: LSU's social media team kindly commented to tell me I'm an idiot: "We are indeed acknowledging a "Snap of the Day" in one of our Instagram accounts (snapLSU), our main Twitter account (@lsu), and our Pinterest account (viewLSU). A Facebook gallery will be going up this afternoon. "), but a project like this could easily be ramped up a bit by picking a daily "best photo" and highlighting it, giving prizes, and organizing a "meet up" at some point of all the people who are taking part. It's never, ever, ever a bad idea to do a little bit of extra work to thank your brand advocates to make sure they feel appreciated and special. So props, LSU! Very well done. Looking forward to monitoring this throughout the month of April.